On 14th November 2017 Microsoft released a security update which will have resulted in most PC’s taking several hours to boot up the following morning and cause a small amount of PC’s to fail the install of the update and get stuck on the loading windows screen. KB4048961 — Windows 8.1 and Server 2012 R2 Security-only Rollup. KB4048958 — Windows 8.1 and Server 2012 R2 Monthly Rollup. Addressed issue where access to the Trusted Platform Module (TPM) for administrative operations wasn’t restricted to administrative users. Addressed issue where access to the Trusted Platform Module (TPM) for administrative operations isn’t restricted to administrative users. KB4052231 — November 2, 2017—KB4052231 (OS Build 14393.1797) for Windows 10 Version 1607 and Windows Server 2016. You can’t import SharePoint lists to obtain values for the calculated columns in the SharePoint list. The Connection Properties dialog box can’t be closed in certain workbooks. Some trusted local macros can’t run if the BlockContentExecutionFromInternet security setting is enabled. KB4011262 — Office 2016: Security update for Office 2016 — This security update resolves vulnerabilities in Microsoft Office that could allow remote code execution if a user opens a specially crafted Office file. KB4011242 — Office 2016: Security update for Word 2016 — This security update resolves vulnerabilities in Microsoft Office that could allow remote code execution if a user opens a specially crafted Office file. KB3162047 — Office 2013: Security update for Office 2013 — This security update resolves vulnerabilities in Microsoft Office that could allow remote code execution if a user opens a specially crafted Office file. KB4011250 — Office 2013: Security update for Word 2013 — This security update resolves vulnerabilities in Microsoft Office that could allow remote code execution if a user opens a specially crafted Office file. 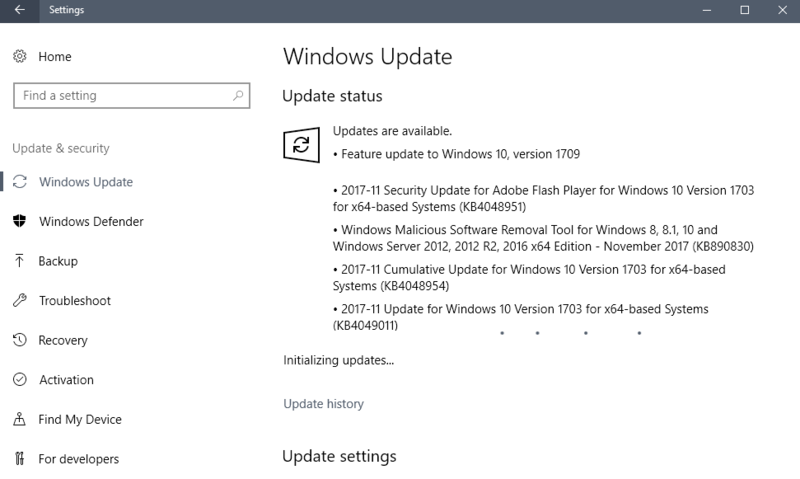 Locate and activate “check for updates” on the page if a check is not run automatically when the Windows Update interface opens.